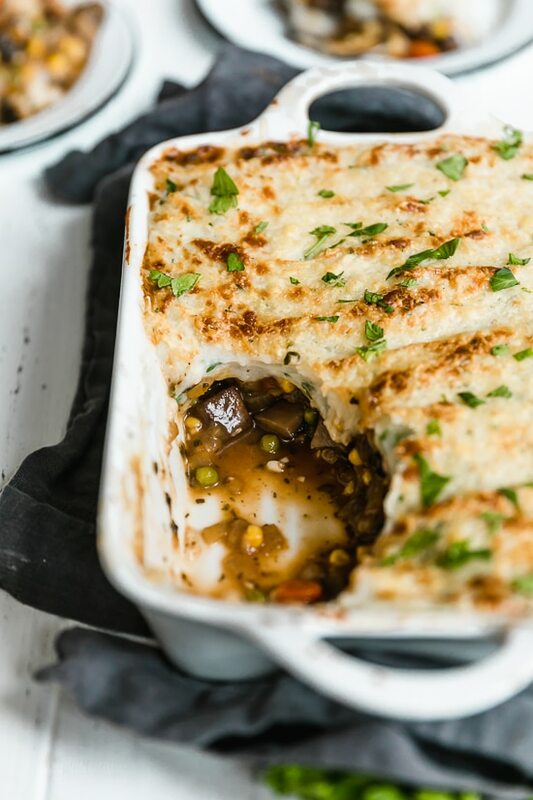 This fast and fresh vegetarian Shepherd’s Pie made with Portobello mushroom, carrots, peas, corn, and onions, all topped with leftover Skinny Garlic Mashed Potatoes, is the perfect after-Holiday fix. Hi Everyone, I’m Heather K. Jones. I’m a registered dietitian, a wellness coach, and the founder of Feel Better Eat Better, an online weight loss program for women who struggle with emotional eating, binge eating, overeating or body image issues—click HERE to sign up for my free weight loss workshop coming soon! I’m excited to guest post on Skinnytaste again (thank you, Gina! ), and I’m so honored to be working with Gina on the upcoming third Skinnytaste cookbook, you’re going to loooooove it! I don’t know about you, but right after Thanksgiving I’m always ready to load up on vegetables and salads. 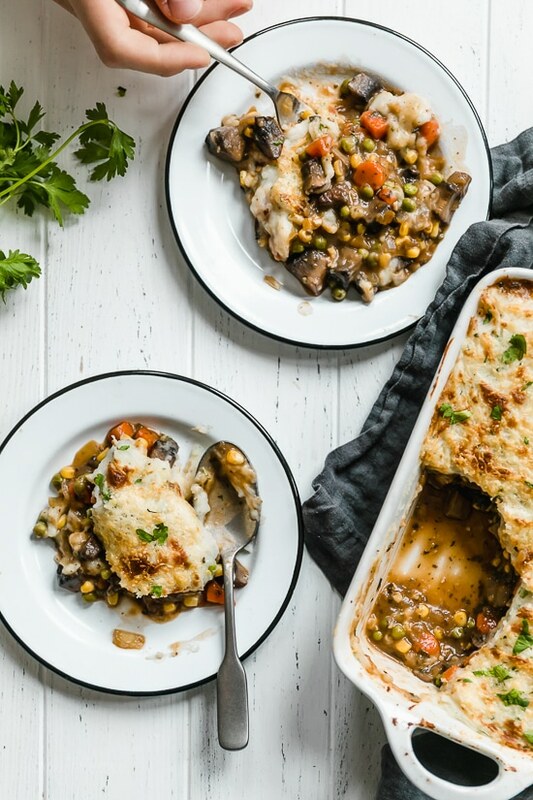 This fast and fresh vegetarian dish made with Portobello mushroom, carrots, peas, corn, and onions, all topped with leftover Skinny Garlic Mashed Potatoes, is the perfect after-Holiday fix. Trust me, it’s so tasty and hearty you won’t even miss the meat. If using, prepare Skinny Garlic Mashed Potatoes according to directions. In a large sauté pan, heat the butter and oil. Add the mushrooms and ½ teaspoon salt, cook for 10 minutes, stirring occasionally. Add the onion, carrots, parsley, thyme, ½ teaspoon salt and pepper and sauté 10 minutes. Stir in garlic, cook for 30 seconds, then add the tomato paste, Worcestershire, remaining ¼ teaspoon salt and pepper. Sprinkle vegetables with the flour, stir to coat and cook, scraping brown bits from the pan, 3-4 minutes. Add the broth, peas and corn, cook, stirring often, until sauce has thickened (about 5 minutes). To assemble: Preheat broiler to high. Transfer vegetables to an 8” x 11” casserole dish. 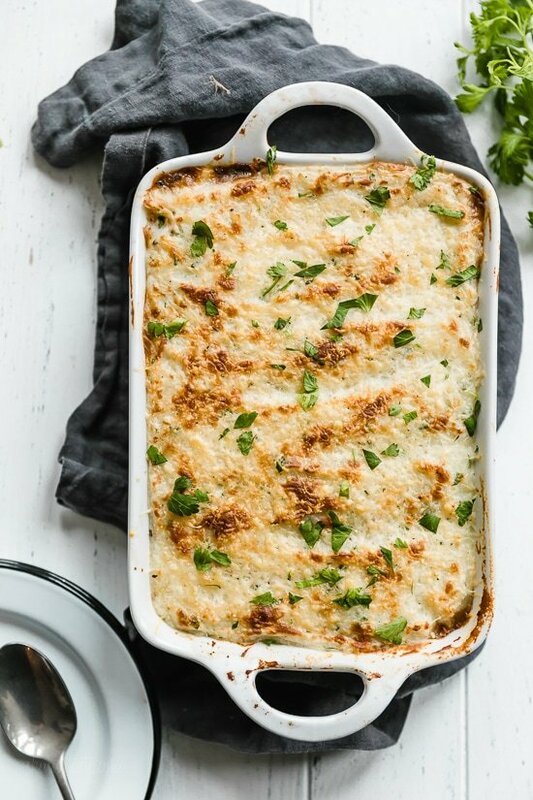 Spread mashed potatoes in an even layer over the vegetables, top with parmesan and broil 5 minutes, or until top is golden. This was super tasty! I always make a few changes to suite the tastes of my wife and I, but I have to say this is one of the better veg shepherd’s pie recipes I’ve tried.Here are the few changes I made: Added celery for a bit of crunch.Used Geo Watkins Mushroom Ketchup instead of Worcestershire. It’s good stuff and my go-to substitute.Used more tomato paste than the recipe called for.Used baby bella’s & button mushrooms instead of portabellos. They were the freshest mushrooms at the store, and they worked great.Added a bit of shallot. Very minor changes, just based on what I had around and what looked fresh at the store. The only real addition I made is adding lentils (broiled in the oven until slightly crunchy) after the veggies were cooked prior to layering potatoes on. Went with a combination of russets & red potatoes… used buttermilk and Kerrygold for the fat after drying and ricing the potatoes. For sides, I went with a quick pickle of jalapenos, sweet mini peppers, & red onion left over from last night. Also added a bit of mushroom gravy (recipe stolen from Chef John. )Thanks for the recipe! This was outstanding! Thank you for another great recipe. Everyone loved it, even my son who is very picky about vegetables. 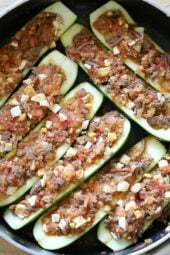 Excellent recipe!…..My only critiques would be to let the veggies cook longer and make ahead! the flavors combine so much better when they have time to meld together…..Will make again. This was delicious! You will not miss the meat! AMAZINGGGGGGG!!!!! COMFORT FOOD WITHOUT THE GUILT! Made with cauliflower mash! Absolutely incredible! Husband and I made it together – not too complicated and wonderful taste. this one’s a keeper! Yummm ……, thank you so very much for this amazing recipe. It’s incredibly delicious as well as satisfying!! Worcestershire Sauce is NOT Gluten Free – this should not be advertised as a GF recipe. Lea & Perrins Worcestershire Sauce is cholesterol free, fat free, preservative free, gluten free and has 80% less sodium than soy sauce. 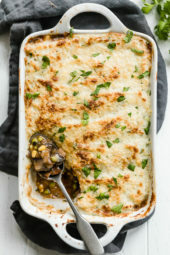 This was really good for a veggie shepherds pie, the mushrooms were a great meaty substitute, and the flavors were splendid. I questioned the use of parmesan at first, but it gives the potatoes a nice crunch! This was so good for dinner last night and I just had some leftovers for an early lunch. So good and flavorful! I opted for the rosemary. My family loved this, thank you! This dish turned out amazing!!! I made it last night and my husband and I looked at each other and said “it’s a keeper.” The only thing different I did was add 2 tsps of dried thyme instead of the two tbs freash it calls for and I followed my own recipe for mashed potatoes (potatoes, milk, and butter). Thanks so much for posting!! Oh my, this is DELICIOUS. Even my meat-loving husband loved it. Make it; you won’t be sorry. We loved this recipe! My kids aren’t fans of mushrooms so I ended up chopping them up finely and then added some vegetarian crumbles – no one had any idea it was meatless and my 7 y/o son said it good enough to bring for leftovers at school. I made 2 of these and froze 1 – what would be the cook time amd temp for the frozen 1? 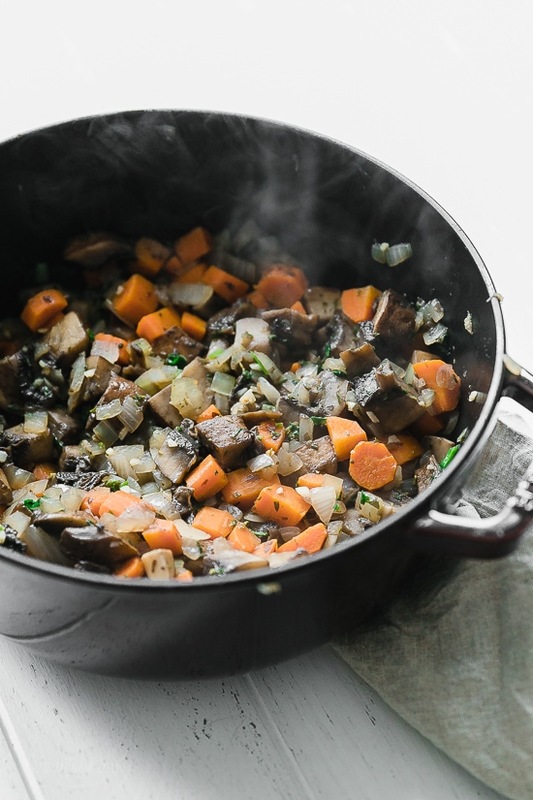 Do you think the sautéing step could be done in the Instant Pot to cut down on time? So, rather than sautéing for the various steps, maybe cooking on high pressure for 5 minutes or something like that? I’ve been looking for a good vegetarian shepherds for so long, and I’ve finally found one. 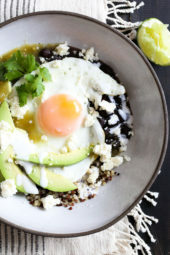 This is a great (and filling) recipe! Thanks Gina! This has the “V” logo which I’m assuming means it’s vegetarian? Parmesan cheese typically isn’t vegetarian friendly and Worcestershire sauce contains anchovies. I substituted mozzarella and used soy sauce in place of the Worcestershire. I think you are confusing vegetarian with vegan. Vegetarians eat animal products that can be harvested from animals without killing them such as eggs and milk. Most parmesan has rennet in it, which is comes from the stomach of baby animals. 🙁 Whole Foods brand of parmesan cheese has no rennet, so that’s what I use..
publish a list like you did last time.? What do you think of the new program. Goiing to class today to find out about. I am updated from 2017 until 2010. Should all be done before the year ends. This is comfort food in a bowl without the guilt. So so good! 100% part of my regular rotation of recipes moving forward! Also, would this work with your Garlic Sweet Potato Recipe? My husband and I cannot have corn, nuts or seeds for medical reasons and these have been cut out of our diet by our Doctor. What can we use in place of the corn? Your help would be greatly appreciated….Thank you in advance. Swap them for more of the other veggies. Hi there – I haven’t made this yet, but don’t eat peas or corn myself. I’m planning to add diced zucchini and make a root veggie mash of parsnips and rutabaga for the topping. The vegetable mixture sounds very forgiving so I may try adding some shredded brussels sprouts in there too. 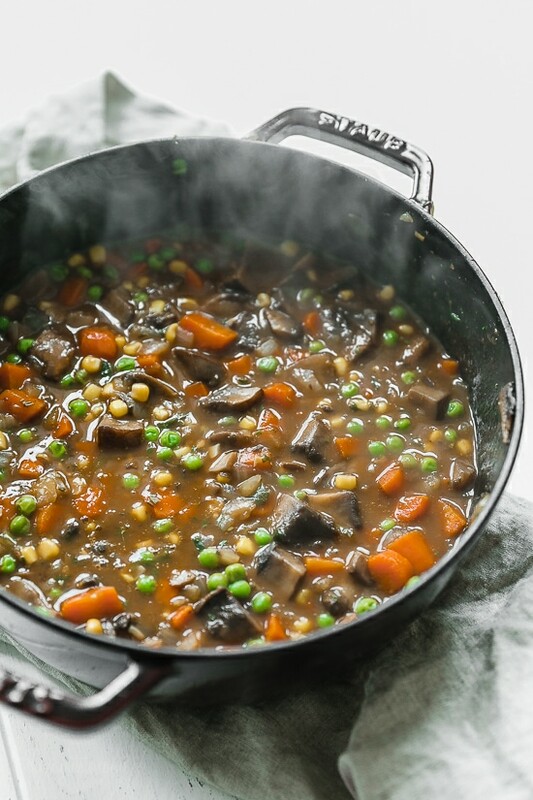 Is Worcestershire sauce vegetarian? I don’t think it is. I have not tried but sure! I’m trying to be lower carb (max 40 per meal) so I think maybe doing half cauliflower mash & half mashed potato may be a good idea. Need to figure out the carb count to see if it would reduce it enough. I made this tonight and it was so good! I added a cup of red lentils and some celery and put some mashed sweet potato on one end too. Delicious! I would highly recommend the recipe! Thanks! Excellent idea on the lentils, I was thinking of a protein to add to the dish. Shepherds Pie is made with LAMB. Cottage pie is usually beef, but can be other such as this recipe which sounds very good. 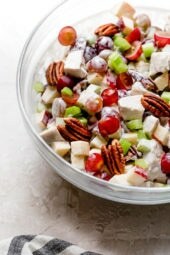 Hi, i am wondering if you will be adjusting the Smart Points in your recipes for Weight Watchers? You do an excellent job, as WW leader I recommend your site to everyone. Thank you, once I know what the changes are I will. Hi I’m wondering what are points plus? I’m on WW and in the nutrition section I see SP then right next to it points (plus sign)… I’m confused! Older program. Not something you need to worry about. This sounds delicious but if following a low-carb plan, do you think mashed cauliflower could be used instead of mashed potatoes? Thanks! I had the same bought!!! 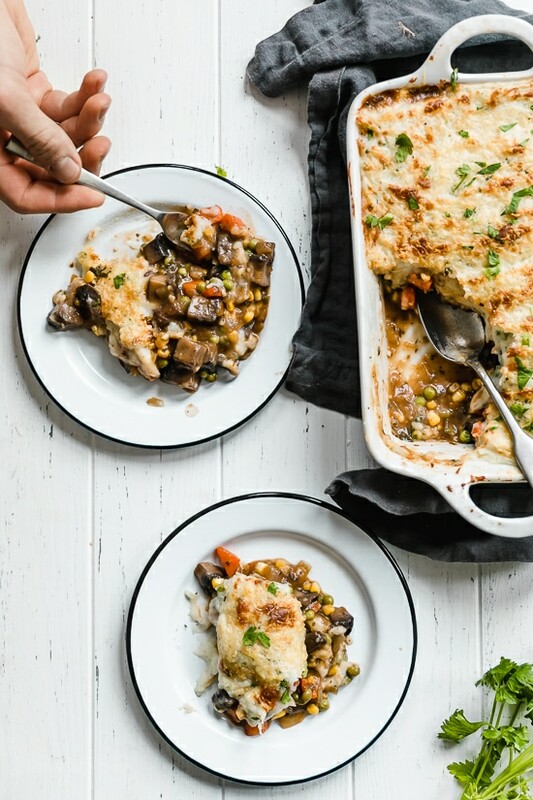 Me and my boyfriend were planning meals for the week and I was like “I really feel like a Shepherd’s Pie!” But the recipe I have didn’t see very healthy. I abandoned the idea and came over the Skinnytaste and saw this was front and center and was so excited! This is REALLY GOOD! My mashed potatoes come out weird (still not sure what happened there) but they were fine once I spread them and broiled. 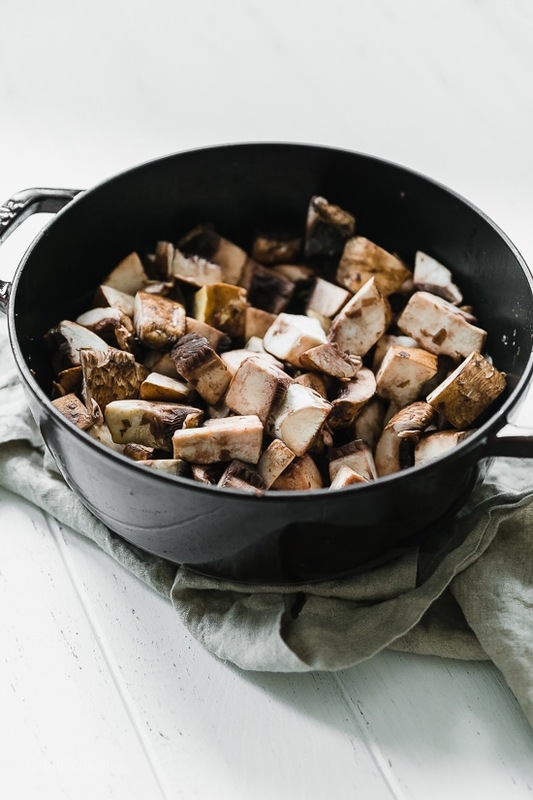 The portobello mushrooms are nice and meaty, and the whole dish is so comforting. Can’t wait to make it many more times this winter! Thank you!